I was born in Cleveland but moved at the age of one to the Chicago area, taking my family with me. We moved to northwest Pennsylvania when I was 11 and the overall family, including 3 brothers and 2 sisters, has been there since. I got a B.S. degree in mathematics from Carnegie Mellon in 1988 and a Ph.D. in operations research from Cornell in 1994. I learned from my dad in 1971, when I was five years old. It was one of many games I played as a kid. I started playing more regularly in 1989 when a friend suggested I try out FIBS (first internet backgammon server). I played my first tournament that year in 1994, in Pittsburgh, and cashed in the Last Chance in the Open division. After several noncashing tournaments, I played in the Intermediate division at a tournament in 1995. I won the Intermediate division and have been an Open player since. I prefer to play matches, with their constantly changing score-dependent strategic considerations. Instead of chouettes I would rather play heads up. I don't really understand why so many players like to be in large chouettes and actually get to play only about 1/3 of the time. For tournaments I like Swiss style. Some have 9-point matches, but I think it would be better to have 7-point matches and then play an extra round or two with the saved time. I would like to see more tournaments use a best of three 7 point matches as compared to one long match. Elo calculations suggest that the chance of the underdog winning is comparable, so that is not really a factor. I think it is just a more interesting contest. Some people have suggested ways to increase the skill level with ideas such as altering the starting position, or requiring that the first move not be a point making play in order to lessen the luck of winning the first roll and to lead to longer positional games. But if the games are longer there may be more skill per game but the skill per time may be the same. Also the luck may just be transferred to later moves. Others have suggested looking at a bot calculated error rate or performance rate to decide a contest but there are many problems with that approach. If one wants to go that route I suggest using variance reduced results instead. You cannot just assume that the bot is perfect (even with rollouts). Playing to the opponent is part of the skill of a game also. The bot may penalize you for making the play that is correct considering your opponent. Exactly how should an ER be calculated? Should forced moves be included? How about potential cube actions? Certain styles of play will fare better than they really should. For example suppose that a player's weakness is that he takes races that he should be dropping. He will be penalized for the incorrect take but then will get to play out a race in which the plays are relatively simple. He may very well get back what was lost by getting to play out the race. The goal of the game is to defeat your opponent not play with the lowest ER possible. This is related to points 2 and 4 above but there is another factor here. Suppose that a player has a choice between two plays that are about equal in equity, For example maintaining contact or racing. If your goal is to play with a low ER you should race. After the other play you will probably make more errors but your opponent will also. Thus players who play a complicated style may have a worse ER than someone who plays a simple style yet be more likely to win matches. There are "tricks" that can be used to artificially improve an ER. Some of these work only with ER calculated in a certain way. Suppose for example that close or actual cube decisions get added to unforced checker plays in the denominator. Then delaying the optional double at 3a–1a post Crawford helps one's error rate. Suppose that someone suggests that it only counts in the ER calculation if it was not optional. Now suppose your best roll followed by your opponent's worst loses your market by a little, so not doubling is an error. But it is such a small error that, if your goal is to minimize your ER, you shouldn't double. Variance reduction is calculated independently of what your play is. The bot considers whether you got a good roll or bad roll and adjusts the results appropriately, and in a fair way. It is essentially the same idea used when doing rollouts. For example suppose you lost a match but got unlucky to an amount equaling 40%. Instead of losing the match 0 to1, you lose it 0.4 to 0.6. If you were gambling for $100 on the match you would lose $20 instead of $100. If you were playing a Swiss tournament, you would be credited with 0.4 wins and 0.6 losses. The big advantage of variance reduction as compared to an ER approach is that you just make the play you think gives the best chance to win the match. Considerations of what the bot would do are not relevant. There are two disadvantages. One is that some just don't understand or accept that variance reduction is fair. I would ask those, though, if they know exactly how the ER system they like calculates the ER. The other is that it does not give an objective number to compare different players who have not played each other. If incorporated into an Elo system, ratings would converge to an accurate value much more quickly though. Short term I have a core group of reference positions that takes a couple hours to look over which I usually review the day before or morning of a tournament. During the school year I participate in discussions at bgonline.org/forums. I have a lot more time during summers when I practice against XG (eXtreme Gammon) and then examine my mistakes, study openings, and study other reference positions. I learned something in the past few months. Over the summer I did not play much but spent a lot of time studying reference positions. When I started playing XG again, I was significantly worse than before the summer had begun. My practice time has now been adjusted towards playing XG more and then when looking over mistakes and thinking about how I could have used my existing reference positions better instead of trying to learn more reference positions. When needed, I am able to calculate or estimate things more effectively and more quickly than most players. This includes things such as pip counting, match equity calculations and one-ply or even a two-ply analysis. It seems to me that some players who are weak in that area tend to accept it but, like other areas of the game, it can be improved with practice. Hopefully I will have finished the backgammon book that has been in my head the last 10 years by then. Much of it will be similar in style to the mathematical material from Kleinman's books. What is your favorite side event or alternative form of backgammon? I enjoy a backgammon quiz as a side event. As far as alternative forms go, I just like regular backgammon. Celebrities playing in serious tournaments. Growing upwards from local clubs especially those at the collegiate level. A complete reversal of the majority culture. Many just don't want to think. Just look at the popularity of reality television for example. Other than tournaments, during the school year I will play about five hours a week on DailyGammon, read backgammon forums about five hours a week and do other practice activities about 10 hours a week. During summer, the other practice activities go up to about 10 to 15 hours a week. Backgammon Boot Camp, by Walter Trice. What about your strategy of letting the clock run down to 10 seconds? What is that all about? That is usually when the last game was at DMP. If there is potentially another game after I probably would have more than 10 seconds left. I just want to play the best I can and often have things to consider or calculate. Some want to make sure they have plenty of time left in case the match reaches DMP thinking that game will be the most important. I find that reasoning flawed though. If using some time earlier would have swung an earlier game you might not have reached DMP at all. Another way of looking at is that mistakes made early in a match can be just as bad as ones made at DMP, you just didn't know it at the time. Say you have 22 minutes for an 11 point match. The maximum number of games is 21 and so some may think to budget about 1 minute per game. But if it doesn't go that long you will have a lot of time left over. Possibly some that you would have wanted to use for a crucial decision earlier. Instead of saving time for a potential future tough decision at DMP, don't be afraid to get a little behind budget to think about a tough decision when they arise. There is a good chance after all that the match will be much shorter than 21 games. If it leads to time pressure later, deal with it then. Some are so worried about facing time pressure that they make sure to never go say under 2 minutes. If that is your thinking then you are just putting yourself in time pressure two minutes earlier. Play a couple practice matches at DMP or 1-away 2-away Crawford, with say only 30 seconds left, before you let yourself get in that situation in a tournament match though. I've been traveling a lot in the last few years and am trying to improve my foreign language skills. One great technique I discovered while watching a show in Japan that was in German language but with Japanese subtitles. I realized I could learn two languages at once that way. From Sept. 1997 to Dec. 1999 I was a Peace Corps Volunteer in Kenya. I taught mathematics and physics in a rural secondary school. I invented a musical instrument in my car. I filled the box between the two front seats with coins. Depending on how it is hit, it can sound like a snare drum or a tom-tom drum. Opening it and closing it in various ways can give other sound effects. I figure I am one of the best in the world at playing it. Also I think I am really good at whistling. I will whistle along with and solo on top of music. Some agree I am good. Others do not care for it though. Who are your heros in backgammonpeople you respect either for their play or for other reasons? My heros in backgammon are those who have helped me improve. David Montgomery and Chris Yep were study partners when I first started playing more seriously. Books by Paul Magriel, Danny Kleinman, Kit Woolsey, and Walter Trice were very useful. Forum posts from and discussions with Neil Kazaross, John O'Hagan and Stick Rice also have been very helpful. 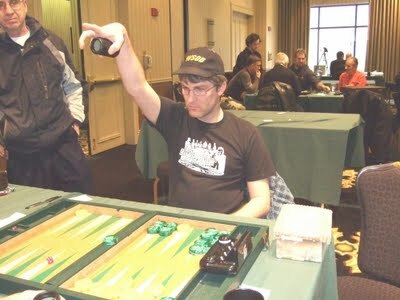 I play in the Beltway Backgammon club near Washington, DC and in the Baltimore Backgammon Club that was formed a couple years ago. I played games of all sorts from a young age and had exposure either from reading (for example a backgammon book my dad had that I read at age 7) or from figuring out myself various probability and strategic concepts. My mathematical concentration is in probabilistic modeling so both my child experiences and education are ideally suited to backgammon. Tell us about your nickname, "UBK"? That comes from Will Cockerell and the readers of bgonline.org forum. My demeanor over the board is fairly steady whether the luck is going for me or against me. Will was writing articles during the Cannes tournament for the WSOB website and referred to me as "the unflappable Bob Koca." The readers of the forum shortened it to UBK. I play at DailyGammon with handle BobKoca. Played via computer interface there is no need for everyone to be physically at the same location. This would allow the possibility of many more players entering. So there could be playing rooms that are proctored in several locations spread around the globe to hit the main playing centers and make it possible for no one to have to travel too far. Say locations in London, Copenhagen, Monte Carlo, Tbilisi, Los Angeles, Chicago, New York, and Rio de Janeiro. Probably Tokyo also, but then time zone issues become a lot more difficult. Each location will have an expert lecture that is transmitted to the other locations and traditional side events as players get knocked out of the main international tournament. The format for the main event would be 11-point matches with time control. Your opponent in each round would be randomly selected from all participants. Friday afternoon would be 3 rounds and Friday evening would be 3 rounds. You get points according to the variance reduced result (for example you score 0.6 points for a 60% win). After the first 6 rounds the bottom half are eliminated. Accumulated scores carry forward. After 3 additional rounds the next lower half are eliminated and this continues until there is a winner. A lot to be codified, and there would be a problem with players not understanding/accepting variance reduced results but something like what I describe is what I would aim for. For scores up to 5-away 5-away, I just have the windows and gammon prices memorized, along with what I consider to be long-race cash points and the equity of a blitz position so that I can see how much of a difference the score makes. For example, a 0.84 double/take two-way priming blitzing game is 1.09 double/take if 4-away doubles 5-away, and is a 1.04 double/take if player 5-away is doubling 4-away. Note this means that, at the 4-away 5-away score, you should slightly skew your opening play towards gammon go instead of gammon save. While setting up the checkers for the next game I mentally remind myself of what I know about the upcoming match score. For other scores I have the match equity table somewhat memorized and I can figure out others. I have the 1-away, 2-away, and 3-away scores memorized up to 11 away. For other scores there are certain scores I have memorized that I use to interpolate other scores. I use the table based on rollouts from a few years ago by Robert-Jan Veldhuizen. I know that the recent Rockwell-Kazaross table has the trailer doing slightly better. I will adjust my final answer if needed. Unless it is a final cube, though, it shouldn't matter too much. So what is the take point at 4-away 12-away? Do you mean with gammons or not? How much time is on my clock? The take point ignoring recubes and gammons will be close to the normal 25%. I am guessing your 31% value is assuming a typical gammon rate but when you are doubling you need the gammon rates at that point in the game. I would do it without gammons and then worry about a gammon price at the next step. I figure it cannot be too much different than 4 away 11 away and since I don't know tables beyond 11 pointers I will do that instead. The 11 away raw goes down about 5% for each increase of one game for the leader. 11-away 4-away is about 50% − (5% × 7) = 15%. One of my values that I know is 4-away 7-away is 30%. I think 4-away 8-away is 25%. I will estimate 4-away 9-away as 21% and 4-away 10-away as almost 18%. Instead of going up equally in 3 steps of 3.33% to get from 15% to 25%, it goes up slowly at first and then more quickly. So I am guessing like 2.8, 3.3, 3.9 instead. So I can drop and accept opponent having almost 18%. Playing and losing makes him about 3.3% better. That is the risk from my decision. Playing and winning puts me at 2-away 11-away, which I have memorized as about 6.5%. So the potential gain from playing on is about 11.5%. This is more than 3 times as large as 3.3% but less than 4 times as large so it gives a take point between 20 and 25%. It is a little closer to 3 times as large, so I will guess 23%. The biggest source of error is that I was not really sure about the 3.3%. But that is how I would do it over the board if I thought I really needed it. John O'Hagan has some rules to go right to the cube actions but I don't quite know them. One thing to point out is that, for the basic take point, the big lead is not really important. In fact, in a last roll situation the 4-away player can take a cube more easily than the 12-away player.